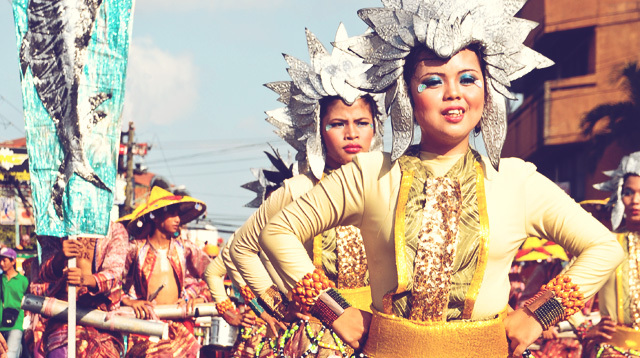 You Must Attend These Philippine Festivals! Celebrate culture, religion, and food when you attend these fun fiestas! Traveling the Philippines won't be a complete experience if you don't attend a festival. Fiestas are common in the country, and the celebrations have gotten grander over the years. There are loads of festivals you can be part of, and here are some you must attend at least once in your life. The Sinulog Festival is held on every third Sunday of January in Cebu City. It's a feast dedicated to the Sto. Niño, and it's a commemoration of the Filipinos’ acceptance of Christianity in the early 1500s. It's one of the most popular festivals in the Philippines with a grand parade and a street party like no other. To differentiate itself from other Sto. Niño festivals, Sinulog has a special dance, a simple two-steps-forward, one-step-back routine. The Masskara Festival is held in Bacolod every third week of October. It began in 1980, when there was crisis in the city and the local government wanted to uplift the spirits of its citizens. It's one of the most colorful festivals in country with everyone donning giant colorful masks, which remind them that they can still rise up from hard times with a smile. There are food fairs and street dances throughout the festival. The Ati-Atihan Festival is said to have inspired the Sinulog Festival, since both center on the Sto. Niño. It's held around the third week of January in Kalibo, Aklan. "Ati-Atihan" roughly translates to “to be like itas/atis,” who were the first settlers in the region. The festival makes use of indigenous and tribal themes in their music and dance. This story originally appeared on Travelbook.ph. Minor edits have been implemented by Cosmo.ph editors.